Winter wheat acres across WI have declined over the past few years due to late grain harvests, disease concerns (FHB or scab) and poor wheat prices, however anyone that lives and works in WI knows that a base number of cereal acres are needed to support the dairy industry (straw and land to summer haul manure). As farmers get ready to kick off the 2017 growing season here are a few suggestions to help get your 2017/18 winter wheat crop established on time. Plant early. If weather and soil conditions allow for it plant the acreage you intend to go to winter wheat first. This is regardless of which crop you plan to follow (soybean, corn silage or field corn). Remember the optimal planting date window for most of our WI winter wheat acres is the last week of September through the first week in October. 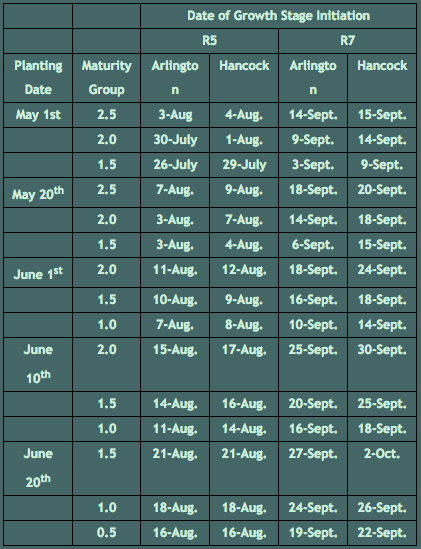 In table 1 below you will notice that for every 3 days planting is delayed we see ~1 day delay in beginning maturity (R7), so delaying planting by one week equates to about 2 days later maturing. However when planting is delaying past June 1st it turns in to more of a 1: 1 relationship. Also remember in WI it normally takes another 5-8 days for the soybean crop to move from R7 to R8 (full maturity). Consider an earlier maturity group soybean. Plant a high yielding, earlier maturity group soybean to help get that soybean crop harvested on time. Though later maturing varieties “on-average” produce the greatest yields, data from our 2016 WI Soybean Variety Test Results show the maturity group range that included a starred variety (starred varieties do not differ from the highest yield variety in that test) was 1.8-2.8, 1.4-2.4, and 0.8-1.8 in our southern, central and north central regions respectively. This suggests that the “relative” maturity group rating is trumped by individual cultivar genetic yield potential. Therefore growers have options to plant an early maturity group soybean that will be harvested on time and not sacrifice yield. Crop rotation matters. Our long-term rotation data suggests winter wheat yields are greatest following soybean, followed by corn silage and lastly corn for grain. Therefore plan your rotation accordingly to maximize yield and system efficiency. Manage for the system not necessarily the crop. If you are serious about maximizing wheat grain and straw yield on your farm one of the biggest contributing factors for both of these in WI is timely wheat planting. Make management decisions to facilitate that. *We all know what inputs can extend maturity that don’t necessarily guarantee greater yields. So instead of listing them and fielding angry emails I am being strategically vague here* As a producer is it better to sacrifice 0-2 bushels of soybean yield or 10-20 bushels of wheat grain yield and 0.5 tons of straw?